Thx for the plugin! It looks really good. Im using it right now on my wordpressblog! I dint read description carefully and I wanted add mime-types from file choosing *.xls (excel) file. 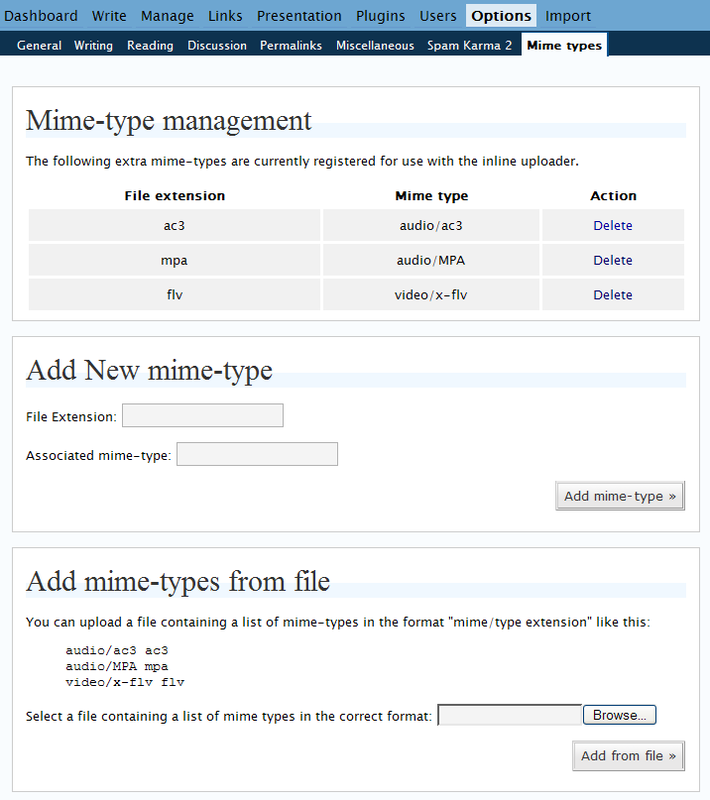 I thought that your plugin adds extension and mime type form the file type not from the list in the file. The problem is that I can not delete the rows. There is no error – I choose “delete” then I confirm and the line remains on the list. Can I remove the rubbish lines manually or how to restore default settings. malin: Oh dear! At present the plugin doesn’t have a handy way to clear out the list. However, if you copy the following code into a file and add it to your plugins directory you can use it to clear out the extra mime-types easily. If you activate this plugin and then deactivate it the extra mimetypes will be cleared out and then you can use the normal plugin ui to add back in the ones you want. Description: Cleans out the extra mime-types. After activating all WP pages were blank. I had to remove file from plugin directory to make WP work again. Where these entries are stored, file or table in db ? How to remove them manually? They are stored in the db. sent it to you in an email. does anyone know, if pjw-mime-config v0.90 runs with wordpress 2.3? i took the plugin and translate it to hebrew, took me 10 min!